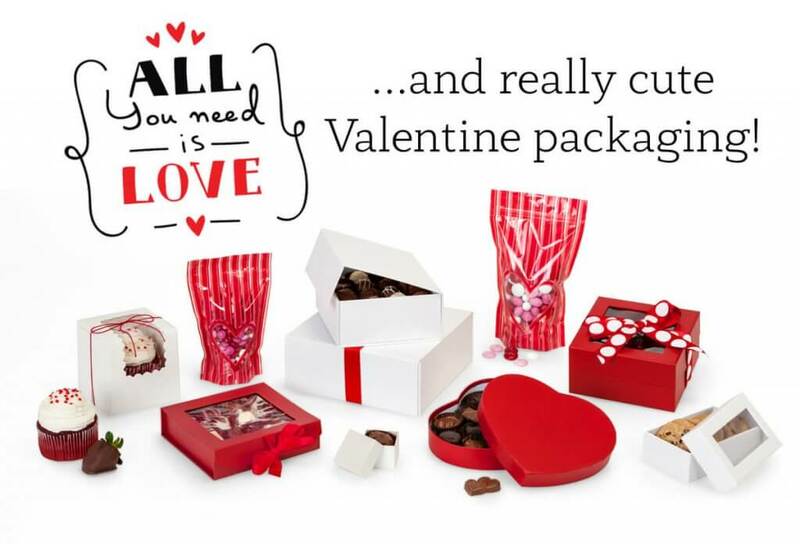 Valentine’s Day is less than a month away, and we want to make sure your shop is ready with candy and floral packaging from Nashville Wraps. The National Retail Federation estimates over half of Americans celebrate this holiday, with almost $20 billion dollars spent on these gifts of love. With Nashville Wraps’ fast shipping, we will get your orders to you quickly. Most Valentine shoppers wait until a day or two before the holiday to select a gift. So have plenty of gifts-to-go in pretty packaging on hand to entice those impulse and last minute shoppers. Shop our 2019 Valentine digital catalog. Forrest Gump may have had it correct about life being like a box of chocolates – you never know what you’re gonna get. But with Nashville Wraps candy boxes, you can be sure your sweet confections will look impressive! We carry top-quality packaging to showcases your products, from chocolate truffles to cookies or cupcakes. Our adorable folding presentation candy boxes have clear windows and attached grosgrain ribbon. You will find our square boxes easy to fold. 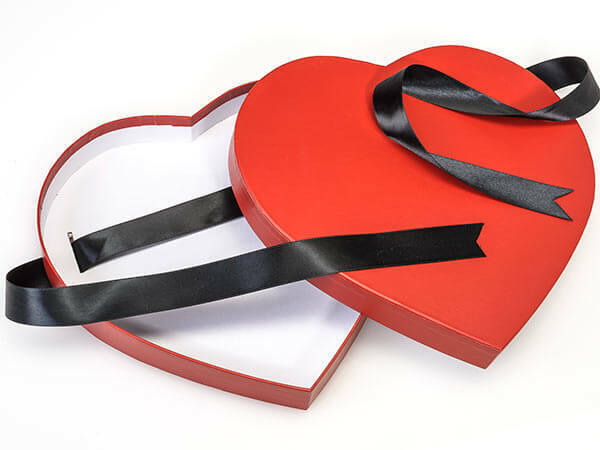 For Valentine’s Day, the red or pink boxes are perfect, or try black for an elegant look. Check out our new natural kraft color with attached grosgrain ribbon in chocolate brown. Fill with candy trays or shredded paper to support your product. You can even include a custom printed label. Watch how easy our boxes are to fold in the video above. Who wouldn’t want a yummy cupcake for Valentine’s Day (or any day, for that matter)? 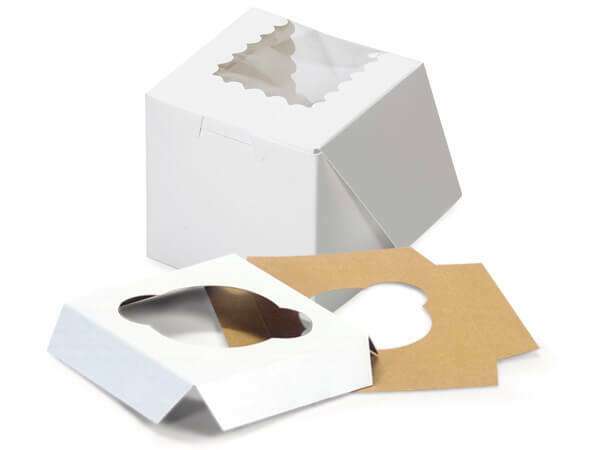 We carry single-use, 100% recycled bakery boxes for cakes, cupcakes and other baked goods, in cartons or small packs. They come with or without windows, in white, pink or chocolate colors, and are stored flat. Remember to add matching cupcake inserts, cake pads and baker’s twine to promote your products. Line your store shelves with our stand-up zipper top bags with gussets. Your customers will flip over the fun designs. The small 4×5.5″ size holds one standard 11 oz. bag of candy like M&M’s, and the medium 5×8″ bags hold two. Our Saran coated bags come in 3 sizes in printed holiday designs and clear, chocolate or kraft styles. You will LOVE our brand new line of upscale magnetic gift boxes. They feature a flip-top lid with a strong magnetic catch for easy opening and closing. Choose from 4 sizes in white, black or kraft. They are stored flat to maximize your storage. Perfect for candy, cookies, and gifts, simply add a beautiful ribbon such as double-faced satin or Valentine ribbon for a stunning presentation. 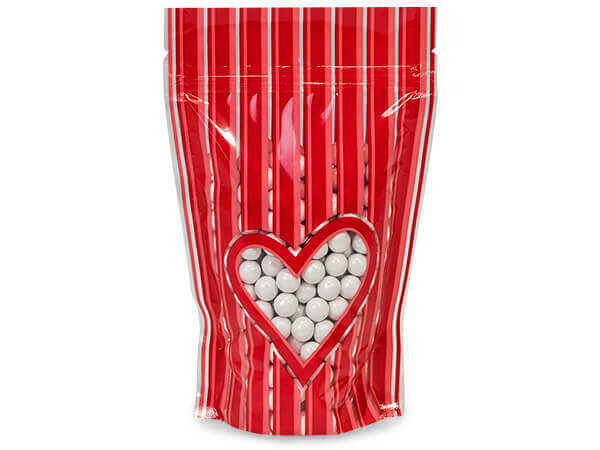 Bring on the love with our heart-shaped candy boxes. They are extra special because they have die-cut slots in the bottom so you can add your favorite ribbon. Select both small and large sizes for a stackable 2-piece set! Heart-shaped candy pads and cups are also available. See our video on how to add ribbon for a pretty presentation. Our smallest boxes are the cutest, we think! 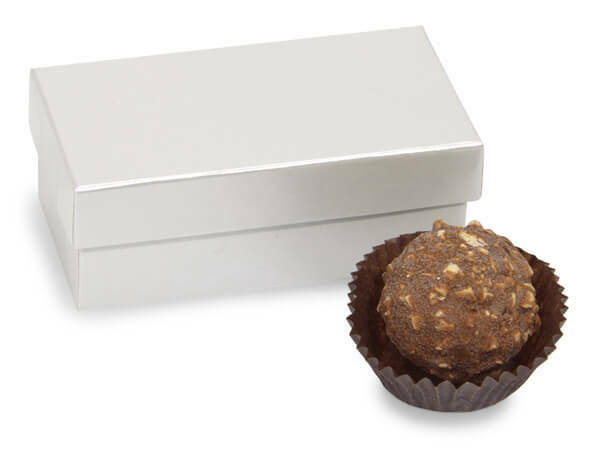 When you need a tiny box for just one or two truffles or candies, our rigid favor boxes are the perfect size. There are lots of colors available, including red, white pearl, gold, aqua, and kraft. 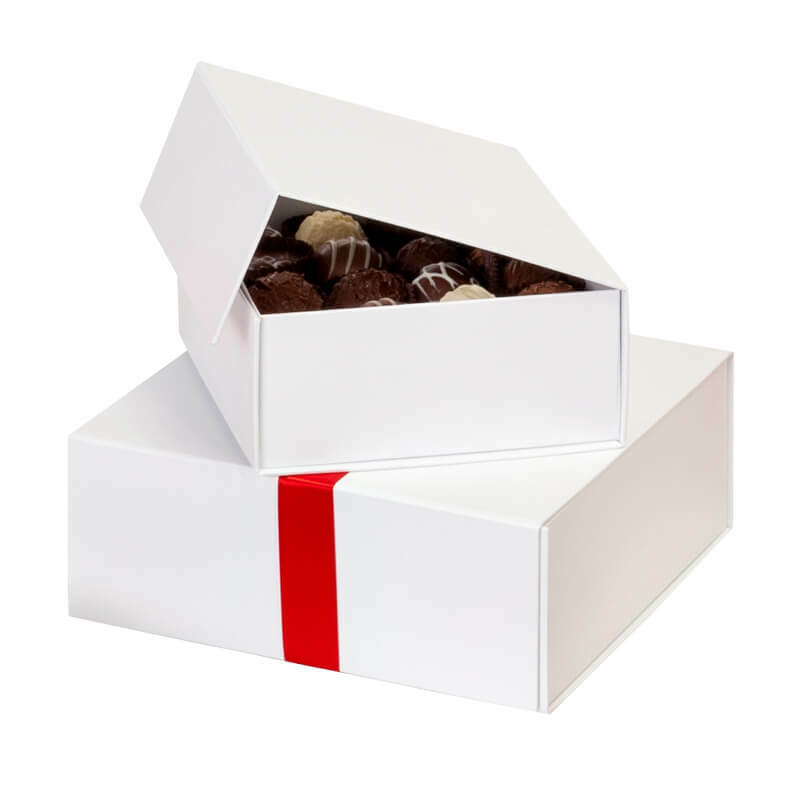 Our most popular candy boxes are these gourmet presentation boxes! 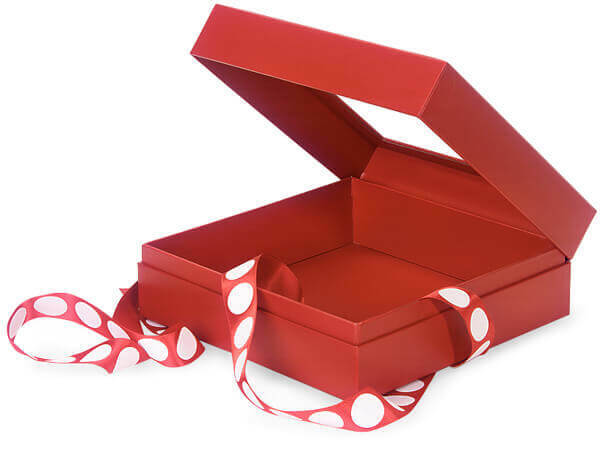 Rigid one-piece, auto-hinged boxes with a clear acetate window in the lid, with a conveniently attached ribbon for bow-making. Candy trays or cookie pads and candy cups are also available. Then just fill our upscale boxes with your product and tie the attached ribbon. It’s a match made in heaven! 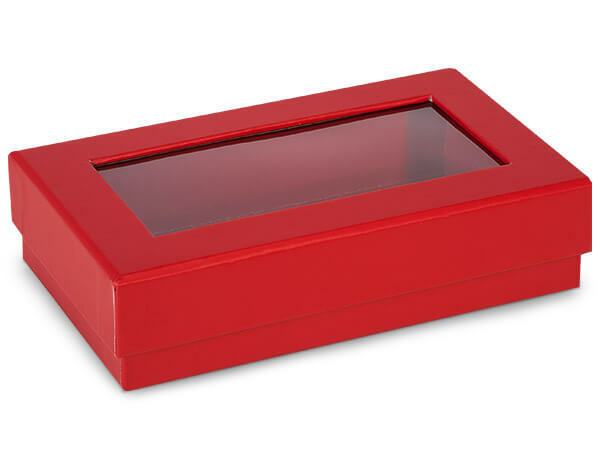 If you’re looking for premium quality boxes that feature a clear acetate window, our gourmet rigid window boxes are a great choice. They are available in petite, medium and x-large and sold by size in bulk cartons. They make beautiful gift boxes and are also great for candies, cookies, and other gourmet foods!